So it got a little colder outside and you hung the bike up in the garage for another season only to longingly wait for spring. Maybe you head to the gym and workout on a stationary bike but that just isn't the same as riding your own bike and it is honestly quite boring spinning and staring at a wall or even out the window counting down the minutes before you get off that massive saddle. It's time you looked into Fat Bike winter riding on your local trails . Each winter I fall in love with cycling again just like I do in the spring. It really is a whole new experience riding the snow covered trails and often in the dark due to the shortened days. You feel like you are flying through the trees guided by your headlight. The ride is a little smoothed out by the snowpack between the roots and rocks and traction is actually pretty amazing with these 4.8 inch wide tires. 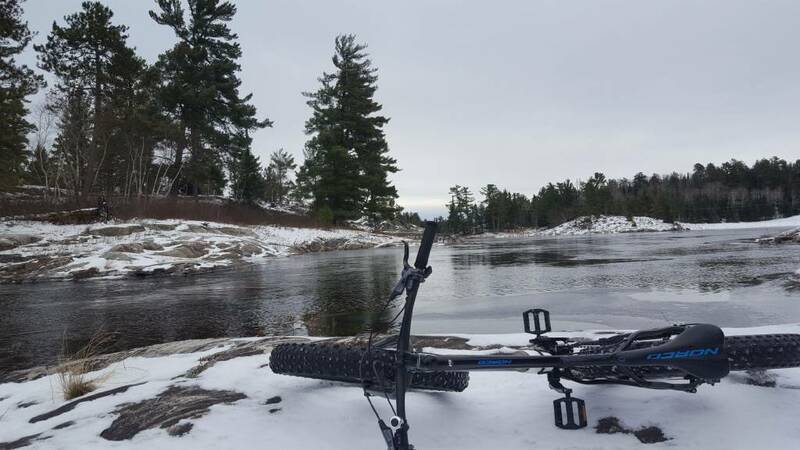 I also enjoy taking the frozen creek from my house as a route to work when conditions are right.I highly recommend giving it a try - The Hardwear Company rents a few Norco Fat Bikes as well as sell a selection of great bikes to add to your quiver. The Bike - rent, borrow or buy one since you will love it anyway. Clothing - dress as you would for XC Skiing - layer up with breathable clothing ( you will work up a sweat) Try Smartwool base layers and a fleece mid layer. Wind proof or resistant shell and XC or winter run pants.